Why should I join the Apex Chamber of Commerce? Being a member of a chamber of commerce gives you and your business credibility. It shows that you care about more than just your bottom line. Businesses who are members of their local chamber of commerce understand the value of corporate citizenship and to consumers, as well as other businesses, that is an important attribute. 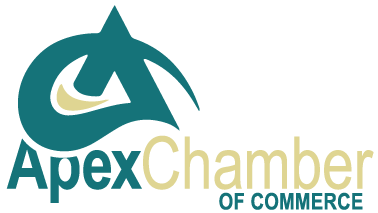 So, if you decide not to become a member of the Apex Chamber, find another chamber that you are comfortable with, and join today. It is the best thing you can do for your business. Can I attend Chamber events if I am not a member? Most of our events are for members only, but we do offer prospective members the opportunity to attend Business After Hours and AM Networking a few times to help them learn more about the Apex Chamber and what we offer. Simple attend our events and you will become involved. We offer a variety of event types and times to accommodate your busy schedule. If your schedule does not allow you to attend events, you will still benefit from the directory listing, online listing, and numerous advertising and sponsorship opportunities. However, the relationship-building aspect is an important part of Chamber membership and a great way to grow your business. People like ot do business with people they know... so come join us! Our membership fees are based on the type of business and number of employees in your business. The goal of the Chamber is to keep member fees as low as possible, while still offering quality programs and personable service. Click here to find membership investment fees. Does the business or organization have to be in Apex to be a member? No, if you want to reach the Apex demographic, then we are the place for you. We have many businesses from other areas in Wake County as members and they simply add to the networking diversity YOU are looking for. We are more than happy to answer any of your questions. Give us a call or send us a quick email.